We're unsurprised these days when EVGA break from the pack and be one of the first motherboard manufacturers to show off upcoming motherboard designs at major trade shows. Such is the case this week at Computex2014 as, seemingly against all hope, they are displaying an upcoming motherboard which will utilise Intel's next generation workstation chipset. Pictured above via TechPowerUp is the EVGA X99 FTW, compatible with the inbound Haswell-E CPUs and utilising Intel's LGA2011-3 socket. Sadly not a great deal is known about the technical capabilities of the X99 chipset, but some of the features of this specific board can be surmised from casual observation. The FTX X99 draws power from standard 24-pin ATX and 8-pin EPS 12V connectors, with optional 6-pin PCIe and 4-pin Molex inputs near the base of the board to stabilise power in multi-GPU configurations. 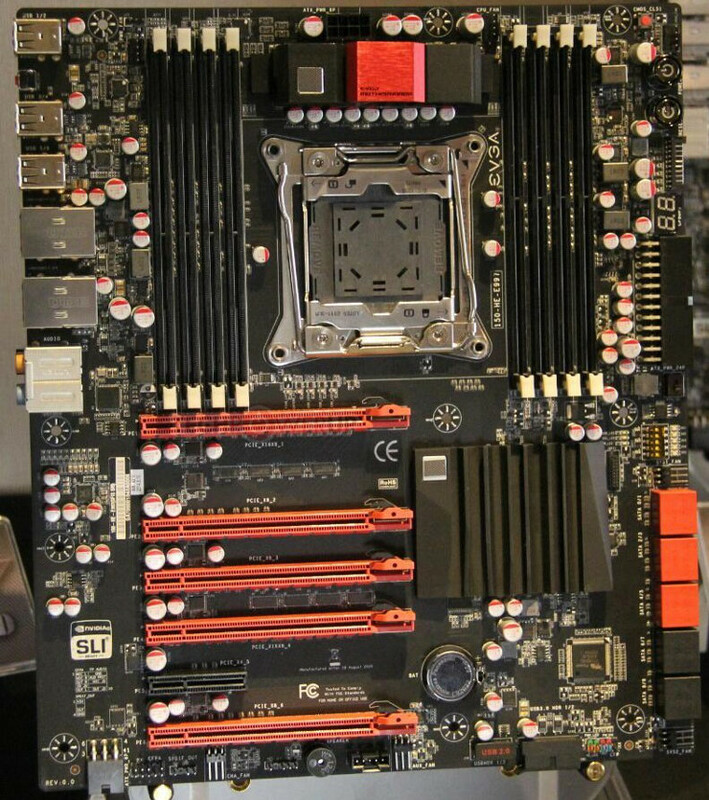 The DIMM layout of previous LGA2011 motherboards returns with four slots either side of the socket, but in this case DDR4 memory is supported over DDR3; no doubt a quad-channel memory interface is standard. Five red PCI-Express slots indicate versatile multi-GPU support, whilst labelling infers a that they are wired for x16/x8/x16/x8/x8 PCIe lanes respectively. Note that the top-most available slot position is used and will present a slight concern for those with oversized CPU coolers. On additional x4 slot (coloured black) is wired to the PCH. In terms of storage this FTW model supports six SATA 6Gbps ports via the chipset and a further six via an additional controller. As you would expect USB 3.0 and 2.0 appears both as headers and on the rear of the board, and of course almost all the motherboard headers and sockets are at horizontal rather than vertical. Interestingly there is no indication of support for either M.2 or SATA-Express, although there appears to be plenty of spare realestate on the board; this could mean that the PCIe storage standards championed on Z97 aren't present in the workstation-class chipset. Substantial overclocking options, including On/Reset switches, Clear CMOS buttons and per-lane PCIe dip-switches are also included as you would expect on a FTX board. Of course the motherboard shown is an early design which may change later, both in terms of slight layout tweaks and heatsink design. They are expected to be released alongside the Intel Haswell-E chips later this year.